Here is a custom 52" Hunter Original that I modified for custom chain suspension. Special features include top mounted light with vintage frosted glass torch flame shade, wingtip blades in oil rubbed cherry, mechanical reversing hub, cast reproduction grape leaf motor grill by Phil Frey. 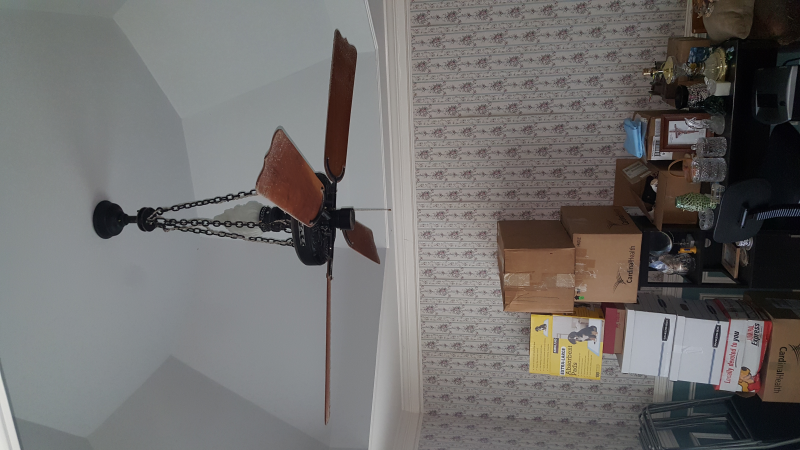 The base fan was a 1970's shaded pole 2 speed model that I outfitted as see in the photo. Please excuse the dust, which of course I will clean when I uninstall it. Uses standard issue Hunter hardware above the canopy, all included. Has been hardwired to low speed to limit tourquing of chains during start up but could be used with appropriate speed control. Local pick up available in Sugar Hill, GA or I will pack and ship at purchaser's expense. Will try to take more photos after I clean this. Asking $500 but all things are negotiable within reasonable margins. Wow, that is very attractive! I love the chain hung look. Also, the top-mount light is a neat touch as well. How much "wrap" do you get in the chains when the motor is switched on? Again, I relly like the old-school look of that chain holding up the iron motor. Very little wrap as I have this set up to only operate on low. It will however still approach a speed resembling hi because you can set the blade pitch shallower. If you steepen the pitch it will run slower. Page processed in 0.1388 seconds (9% database + 91% PHP). 28 queries executed.